I actually managed to get my card done relatively early today! Yippee!! I always like to make sure I have it done before Jonathan gets home from pre-school so that he and I can do things together in the afternoon. As you can see, this card is super simple. As you can see below, one of the challenges was to use white space which is why I opted to do the sentiment in the middle as small as I did. I just did not want to take away from the white space in the center. The White Circle is a SVG digital cutting file that I bought from Two Peas a while back. I love the versatility of being able to cut things with my cricut whenever I need something fast and easy. This card is a square card and it measures 4 3/4 x 4 3/4. 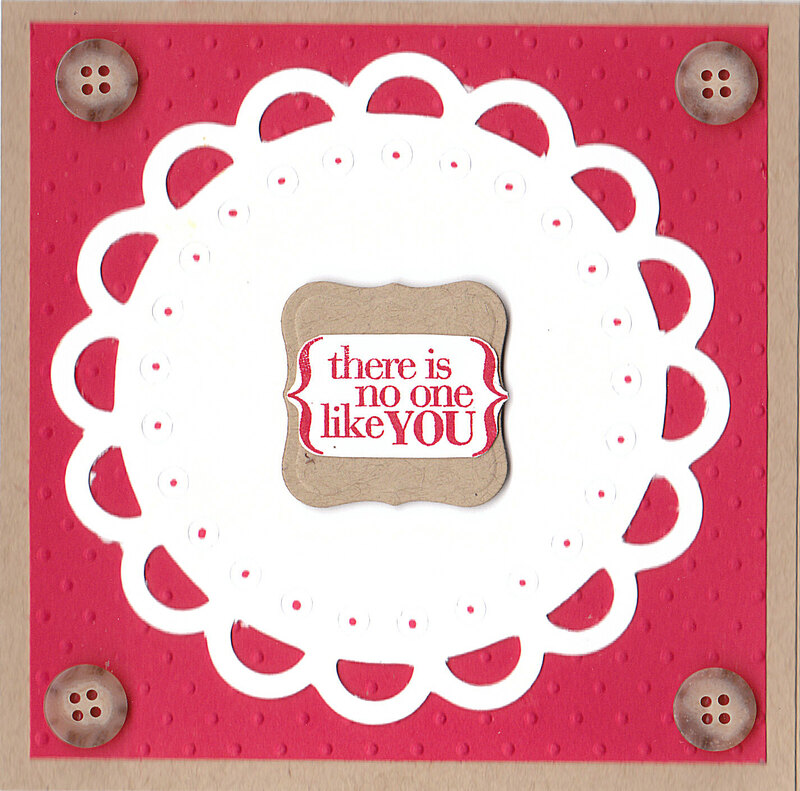 I used my swiss dots embossing folder for the red piece and the stamp in the middle is from Hero Arts. Thanks for stopping by and thank you for any comments you leave. I love to read them! Also, be sure to come back tomorrow. I will be making a very special announcement!!! Until then have a fantastic day! 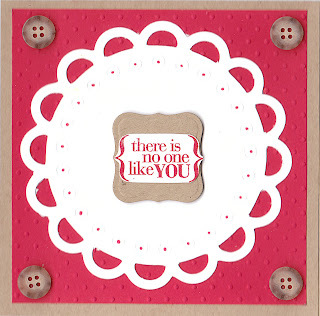 Hi Dori, a very pretty cas card. Very cute! I like the buttons :-) Thanks for playing with 365 Cards! Fabulous card. Thank you for joining in the Dutchdare Card Challenge this time. Thanks so much for playing.